In 1983, Keith Addison and artist-photographer Christine Thery rented an empty house in Tai Long Wan village from Fung Pak, the oldest man in the village. In 1970 there were about 25,000 hectares of farmland growing rice in Hong Kong's rural areas; by 1983 there were only five hectares left, and two of them were in Tai Long Wan. That's why we went there: this was one of the last intact examples of the old local traditional farming system. A great deal had changed in Guangdong Province in China where similar systems had been used, while Taiwanese and Southeast Asian traditional farmers used different versions of the basic Chinese farming system, and they'd also changed. Tai Long Wan was a backwater -- the villagers all had their TV sets these days, but they'd had little to do with the modern world until the late 1960s. They were still living in the Ching Dynasty. The farming system is rice-based, and in Tai Long Wan most of the bits and pieces of it were still in place, with a bit or a piece missing here and there, because it was winding down fast. 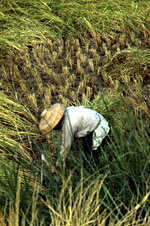 Only two of the families still grew rice. Three-quarters of the village fields were fallow, three-quarters of the orchards on the hillslopes were run-down or overgrown.Half the sheds weren't being used, most of the families had sold their cattle, there were no pigs left. Only half the families kept chickens, there were only two geese, no ducks, and no ponds. The villagers fished off the rocks and gleaned the shoreline pools for a constant harvest of seafood, but they had no boats anymore. In 1970 there were about 120 people living in Tai Long Wan. By 1983 there were only 22: most of the younger villagers had moved to the city, leaving a village of grandparents and a few grandchildren. The whole middle generation was missing. Many Third World villages have this problem, along with the labour shortage that goes with it, or the opposite problem: too many people, and not enough work for them. In the one you count hands, in the other, mouths. By then an increasing number of Third World development workers were suggesting the traditional Chinese farming system was a better model for agricultural development in Southeast Asia and elsewhere than modern industrialized farming methods were proving to be. As journalists we'd spent several years investigating and reporting on development issues in Southeast Asia. In a nutshell, this is what we'd found: modernization had helped nations to become not only self-sufficient in staple crops like rice, but exporters, while the numbers of poor, landless and malnourished people in their populations swelled into the millions at the same time, amid rampant environmental problems. We became increasingly interested in the Chinese model and in traditional farming systems in general as an alternative basis for development, and we had rather definite views on just what development meant, and what it didn't mean. "Who benefits, and at whose expense?" we wanted to know. Don't always believe what they tell you in the city -- go and see for yourself. Traditional farms may be "old-fashioned" but they can be highly productive, using methods which rely on locally available, renewable resources instead of expensive inputs from outside. 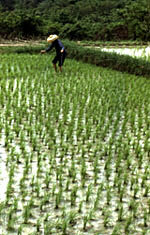 Traditional farming is usually well adapted to the local environment -- the traditional methods are sustainable. Traditional farms tend to be small. Contrary to popular belief, studies from all over the world show that small farmers usually produce more per unit of land than large farmers do: one-third more in India, 60% more in Thailand, and three to 14 times more in Latin America, according to the World Bank (World Bank, The Assault on World Poverty -- Problems of Rural Development, Education, and Health, Johns Hopkins University Press, Baltimore, 1975). In spite of this, most rural credit and most rural development aid in the Third World goes to large farms, excluding the small farmers (although small farmers are usually a better credit risk, even in the US). This "trickle-down" approach simply doesn't work -- as usual, the rich get richer, at the expense of the poor and marginalized people the schemes are supposed to be helping. Traditional systems are also flexible -- they can be adapted to a wide variety of local conditions, they make the most of local resources, they can absorb extra labour, or make do with not enough labour. Traditional vegetable farms in Hong Kong in the 1970s had 4.5 workers per hectare, in Thailand 3, in Malaysia 4.3, in the Philippines from 3 to 8, while brigade farms in South China used 21 workers per hectare. So we went to Tai Long Wan to learn more.